SES Trustee and Operation Draker Trevor Moss has been busy contacting former Operation Drake venturers to gather for a reunion to mark the 40th Anniversaryof the expedition. 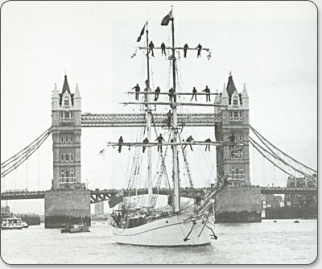 He has arranged for the Eye of the Wind, the brigantine which sailed around the world, to visit the UK (and be moored at the jetty for HMS President) as a focal point for this reunion. Day sailings will be available for alumni, family and friends to enjoy, as well as a reunion celebration to be held in HMS President’s Ward Room on Wednesday 23rd May 2018. Tuesday 22nd May 2018- Day trip aboard Eye of the Wind- Gravesend to London - 10am to 5.00pm - discounted price for Operation Drake Alumni €100 per person, based on booking prior to 15th December 2017. (PM) Tuesday 22nd May 2018- SES Explorer Awards, Imperial College, London (to which Operation Drake Alumni are extended an invitation at the SES Members’ discounted rate of £15). Wednesday 23rd May 2018- Day trip aboard Eye of the Wind- Pool of London with the possibility (to be confirmed) of sailing under a raised Tower Bridge - 9am to 4pm - discounted price for Operation Drake Alumni of €100 per person, based on booking prior to 15th December 2017. (PM) Wednesday 23rd May 2018- 5.00pm to 11.00pm - Reunion party on board the Eye of the Windand at the Ward Room of HMS President including food, celebratory drinks and entertainment (and with a cash bar) - £(GBP)50.00 per person (estimate depending on number of attendees and potential sponsorship). Thursday 24th May 2018- Day sail aboard Eye of the Wind- London to Gravesend - 10am to 5pm - discounted rate for Operation Drake Alumni €100 per person, based on booking prior to 15th December 2017. Thursday 24th May at 7pm to Sunday 27th May 2018 at 10am- Gravesend to Ramsgate - €720 including accommodation aboard ship, based on booking prior to 15th December 2017. Overnight accommodation aboard ship is available for those who require accommodation following day sails and events (subject to availability), for €75.00 per person, per night (accommodation in double cabins). REGISTER YOUR INTENTION TO ATTENDthe Operation Drake Reunion on the evening of Wednesday 23rd May (and the number of your guests so that we can send booking details to you for this event). Bookings for day sails and berths aboard the Eye of the Windshould be made to info@eyeofthewind.net - NOTE DISCOUNTED RATES APPLY ONLY TO BOOKINGS MADE BEFORE 15TH DECEMBER 2018. SES Members who did not participate in the Operation Drake expedition are most welcome to apply for the sailing activities aboard the Eye of the Wind. Book your ticket(s) for the SES Explorer Awardson Tuesday 22nd May 2018 (Operation Drake Alumni may purchase tickets at the SES Members’ rate of £15). Eye of the Windprices are per passenger, including voyage, cabin (other than day trips), meals. Unlimited coffee, tea, water and soft drinks, as well as port charges and tax. Alcoholic beverages and personal on-board expenses are not included. Trainees aged from 16-25 years receive a 50% discount on all voyages (except day trips). Accommodation: Comfortable two-berth cabins with cold/hot water, shower, lavatory, and air conditioning. NOT INCLUDED: Transportation to and from ports of arrival and departure, shore excursions. Ports and destinations may be subject to change due to unpredictable weather conditions. All information as of November 2017. Itinerary may be subject to change without prior notice. For those proposing to book flights into and out of the UK, it is recommended that you provisionally state that you wish to reserve places for the above-mentioned events and/or on board accommodation and receive confirmation of such prior to paying for flights and other costs as all proposed events are provisional at this stage. Please note that no responsibility will be incumbent upon the Scientific Exploration Society, its Trustees, Officers, Members or Staff for cancellation, curtailment or changes to pricing to these proposed events or any subsequent alterations beyond its control. Enquires are currently taking place to seek discounted rates for hotel accommodation in London. There may also be opportunities to ‘bunk down’ at fellow ex- Operation Drakers’ premises in or around London and/or garden camping (details to follow).